Here’s a safety tip for the workshop. The other day I was in the garage tossing some junk into a box marked “electrical components for disposal.” These are the kind of small electronic items — computer gadgets, chargers, an old beard trimmer and the like — that we’re not supposed to be dumping in landfills. They’re also not supposed to be mixed into the household recycling tote. At the county courthouse parking lot, there is a regularly scheduled pickup for electronic component recycling. Being a conscientious tree-hugger, I try to deep six this stuff where it belongs; mainly in someone else’s possession so I no longer have to deal with it. One item, an old external computer hard drive, gave me pause. What if there’s sensitive data stored on it just waiting to be lifted by some unscrupulous recycler? So I set about disassembling it to reach the internal hard drive platters and destroy them. The brushed aluminum housing and stand came off easily enough by removing a few screws. I tossed those metal pieces into the regular recycling tote. 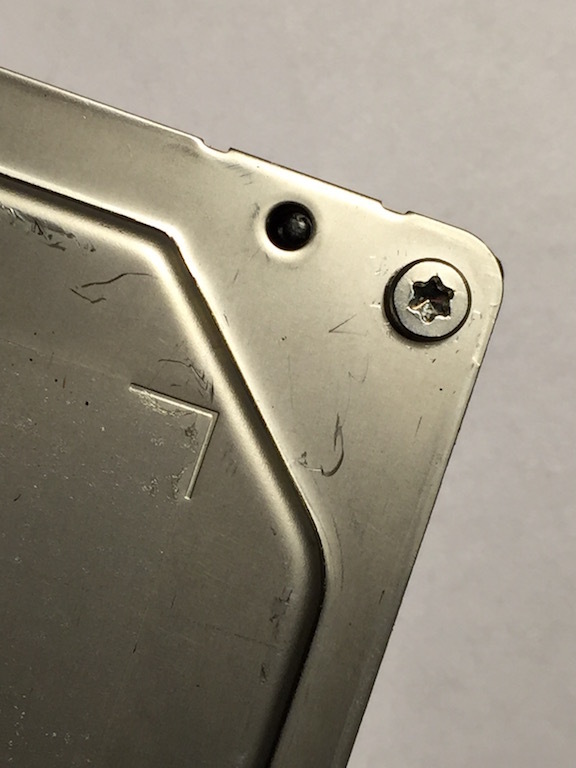 The hard drive itself was sealed in its own metal and hard plastic case. Its metal cover was fastened with eight tiny screws, the heads not more than 1/16 inch across. These were special “torx” head screws, characterized by a star pattern, instead of the more standard phillips or slotted type. Not having a torx fitting small enough for such a tiny screw head, I chose to simply pry off the cover and break the screws. I put on my safety goggles, picked up a tool and began prying up a corner. The first screw head broke off easily and fell to the workbench. Moving the pry bar to the next corner, I gave it a quick twist. In a split second, the screw head snapped and took off like a missile. Its trajectory, as if guided by nose hair technology, landed it deep inside my right nostril. My first reaction was “don’t breathe!” Thinking on my feet, the next breath taken was through my mouth, which was gaping open in disbelief. Sparing you the unsavory details, I eventually was able to dislodge the pesky little missile which made a soft landing in a Kleenex tissue. No blood or obvious damage was done. Even this incident, traversing six degrees of separation at the speed of light, reminded me of a song. If I hadn’t been able to remove the screw head myself, a medic wearing latex gloves might have had to retrieve it from my nostril with a surgical tool. Vinny Barbarino’s classic “Up your nose with a rubber hose” from the 1970s TV show, Welcome Back, Kotter came to mind. The opening theme song, Welcome Back, was written and performed by John Sebastian who, hopefully, never had either a rubber hose up his nose or a tiny screw head. The happy ending of this story is accompanied by an equally happy song that you can hear by clicking on Welcome Back by John Sebastian. Oh, wait. I almost forgot the safety tip. Here it is. In addition to wearing safety glasses while at your workbench, you may also want to consider a surgical mask to protect nose and mouth orifices from rocketing debris. A pair of earbuds connected to your mp3 player loaded with John Sebastian songs might help protect those ear canals too. Don’t screw around with your nostrils! Funny! What are the chances? But more importantly, is there anything that doesn’t make you think of a song? I think my brain is wired to associate everyday events with one song or another.